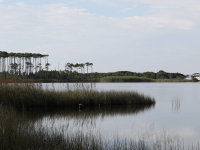 There are so many things to do in Destin and South Walton, Florida. Visitors love to hit the beach, sample some seafood, and of course — shop! Opportunities for great shopping are all around, from an outlet mall to unique galleries and shops in Grayton. We’ve rounded up some of the best places to shop in Destin and South Walton below. Silver Sands Premium Outlets is a fantastic outlet mall in Miramar Beach (adjacent to Destin). 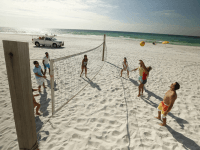 And it’s easy to get there — Hilton Sandestin Beach offers a complimentary shuttle service to and from Silver Sands. At Silver Sands Premium Outlets you’ll find 110 designer and brand name outlet stores including Banana Republic, J. Crew Factory, Coach, Michael Kors Polo Ralph Lauren and Saks Fifth Avenue Off 5th. Upon check in, resort guests also receive an exclusive shopping pass from Silver Sands Premium Outlets. Do you need any more reasons to check it out? Resort guests also receive an exclusive shopping pass for nearby Grand Boulevard. Minutes from Hilton Sandestin Beach, Grand Boulevard is a large shopping area featuring stores that sell beauty products, home furnishings, décor, wine, and a variety of apparel. Shops include Brooks Brothers, Anthropologie, J. Crew-at-the-beach, Chico’s, Vineyard Vines, Tommy Bahama and L’Occitane En Provence. Our resort also offers complimentary tram service to nearby Village of Baytowne Wharf — which features a variety of shops, restaurants and attractions. Baytowne’s shops cater to all needs, with everything from a Lilly Pulitzer Signature Store to a high performance offshore fishing gear retailer. The Market Shops are a collection of unique local boutiques just outside the entrance to the resort, an easy walk or bike ride away. Here you’ll find everything from clothing and swimwear to chocolate, art and more. Try The Dressing Room Boutique for women’s clothing and accessories and The Foster Gallery for goods from local artists. Resort guests can get a sneak peek of what’s available at The Market Shops in the window displays on the first floor of our Spa Tower. 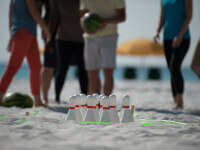 Grayton is a small beach town along scenic highway 30A, about a 20 minute drive from the resort. Known for it’s artistic community, Grayton has a quaint shopping area with unique apparel, gifts and art created by local artisans. Check out Mary Hong’s studio and gallery, which features glass mosaic and recycled glass artwork. You can even try to create your own masterpiece at The Shard Shop, which offers glass collage art classes for all ages. Allison Craft Designs is another great shop in Grayton. Jewelry designer Allison Craft creates beautiful, one-of-a-kind pieces from pearls and leather. When it comes to shopping in Destin and South Walton — there are plenty of options to keep you busy. Come see why shopping is one of the best things to do in Destin.